Financing Manufactured or Modular Houses. One more point on the differences between a manufactured or modular home is the types of loans you can get. When trying to mortgage a modular home you would be looking at typical mortgage products because the dwellings are built to local codes and comparable to a stick-built (wood framed) property. Overall it’s fairly typical. 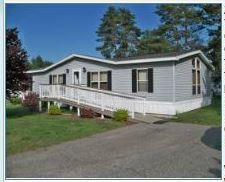 Financing a manufactured home is different. Not every lender will finance a manufactured home, and the rates can sometimes be higher. One of the reasons for this is that manufactured homes tend to depreciate in value, and have shorter life-spans than a traditional property, causing more risk to the lender. If it was “manufactured” prior to the HUD code established 1976 it is considers a mobile home and not eligible for government backed financing, FHA, etc. Most of these end up being cash sales due to the lack of financing available. Depending on how “mobile” the home is will determine if it’s “personal” property or “real” property. If it’s on wheels, not permanently attached to footings, you would most likely need to get a personal loan, not a mortgage. For more information you should talk to your lender. I am only a real estate agent and appraiser, not a mortgage professional. From Everything Real Estate with Jenn, post Financing Manufactured or Modular Houses.